The first electric billboard in Oslo, first lit the day before Christmas Eve in 1909. Hated by some, loved by others. The clock came later (1925). When it's dark, the billboard will light up, as you can see in this YouTube video. It's a landmark here, you can see it from far away. In the evenings I can see this from my balcony, and I live about 8 kilometers away. 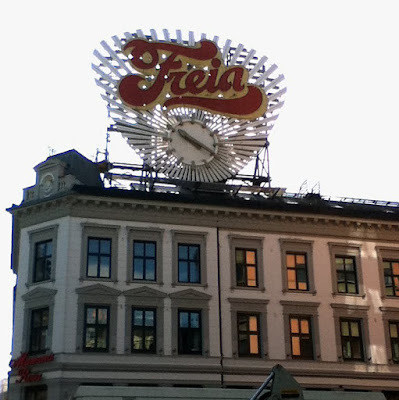 Freia is a Norwegian chocolate factory. If you ever visit, you should have a taste of it! Spring is here, turn on the water!